My mum and most of the ladies in our neighbourhood would get together and prepare Mamra ladoo in India on the day before the festival of Makar Sankranti (14th January) . We kids eagerly wait the whole year for these ladoos as my mum would make them only during this festive season. Along with all these delicacies Til (sesame) Fudge and Kachriyu ( crushed sesame sweet ) mamra ladoos does not require much cooking time. We siblings make frequent visits into the kitchen and gets impatient while mum prepares them, the aroma of roasting sesame or puffed rice, while ghee and jaggery warms up and fill the house with warm redolent aromas and other ingredients combined into, that just make us want to eat it there and then! Sadly, we all have to wait till we offer to god on makar sankranti day and then take them on roof and share and munch them with friends and family...while we fly kites and enjoy the electrifying atmosphere. 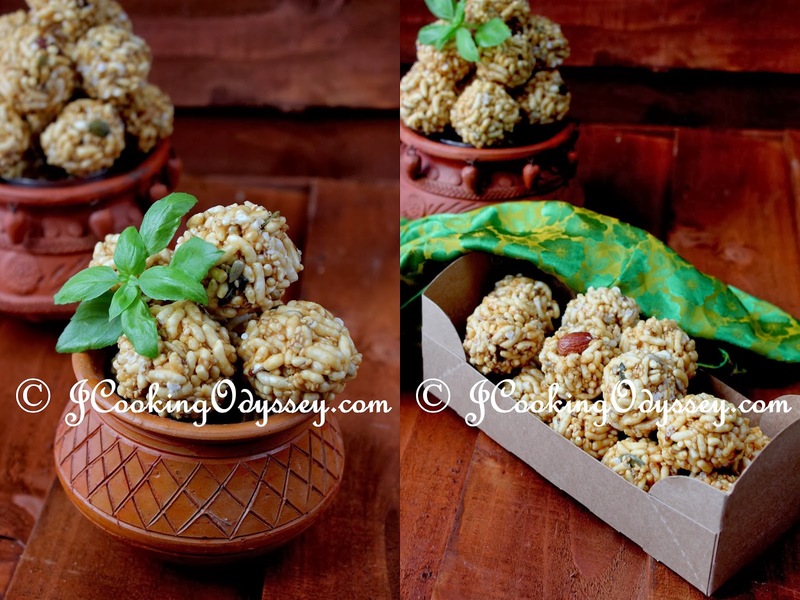 These scrumptious ladoos are delicious as any ladoo, but much more crunchy and so light almost like rice crispies cakes, as there is hardly any ghee these ladoo. 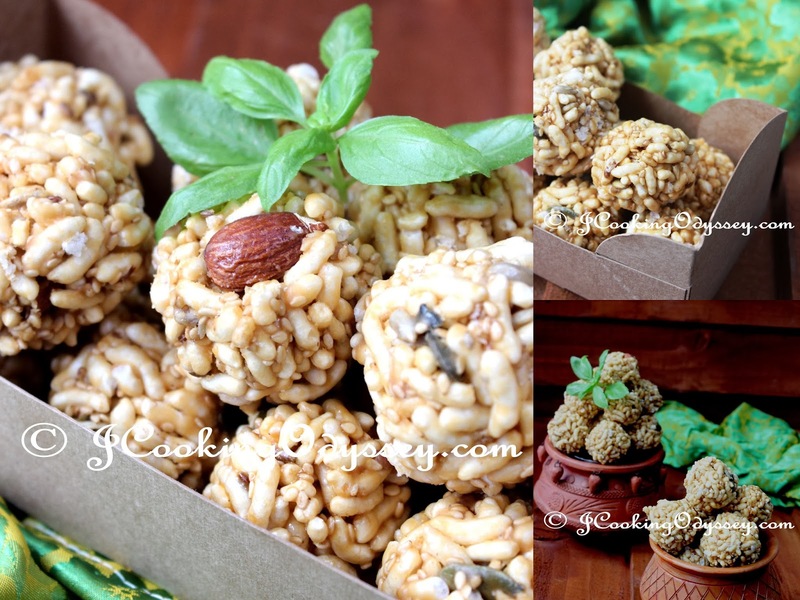 Puffed rice coated with jaggery and shaped into balls, very easy snack recipe to munch anytime. She did not add any seeds or nuts, but by adding few seeds and nuts I gave little twist to this recipe. 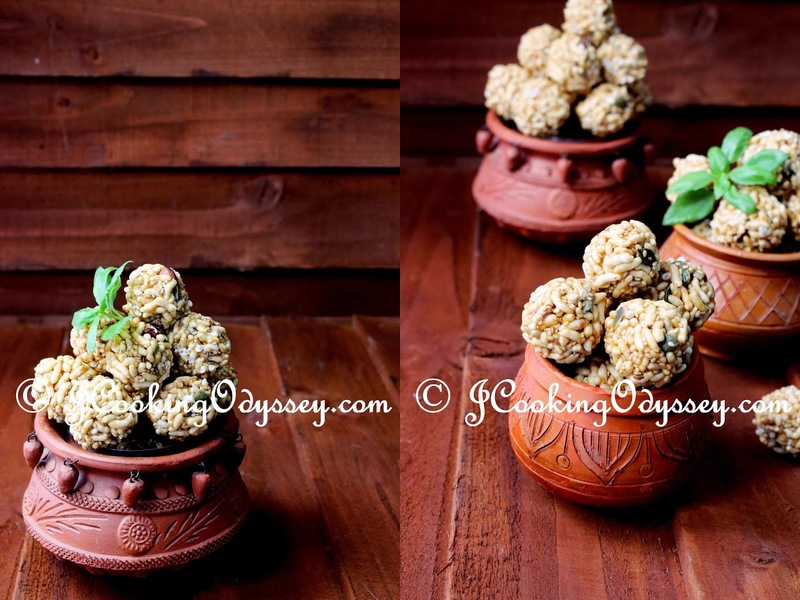 Jaggery or Gor is consumed a lot in Indian cooking during winter months. Gor, is a pure, wholesome, traditional, unrefined, all traditionall made from sugar cane juice. Molasses protein, vitamins, minerals, sucrose glucose, and very rich. In addition, molasses is a good source of a lot of iron and copper. Gor is considered the purest form of sugar molasses. Interestingly, molasses are complex carbohydrates that are digested and absorbed slowly. In addition, the gradual release of energy and heat energy provides for a longer period. For the fitness buffs it can be a good sugar supplement - in moderation! Jaggery has the ability to cleanse the body. Moreover, our body acts as a cleaning agent and molasses effectively cleanse the respiratory tracts, food pipe, lungs, stomach and intestines. Since molasses is rich in iron, it helps to prevent anemia. Because of its anti-allergic properties, molasses can help asthma patients. It purifies the blood and prevents rheumatic afflictions and biliary disorders and treatment prevents jaundice. Let's rush to the kitchen and prepare these wonderfully tasty ladoo with less than five ingredients and in less than fifteen minutes ! Although, it took me a pretty long time to master! Clean and roast puffed rice on a very low heat in a heavy based pan for 2-3 minutes, so puffed rice gets more crunchy. Transfer them into another plate and leave it aside. Heat ghee in same pan and add shredded jaggery, keep stirring on a low heat until jaggery starts bubbling. take care not to burn the mixture. 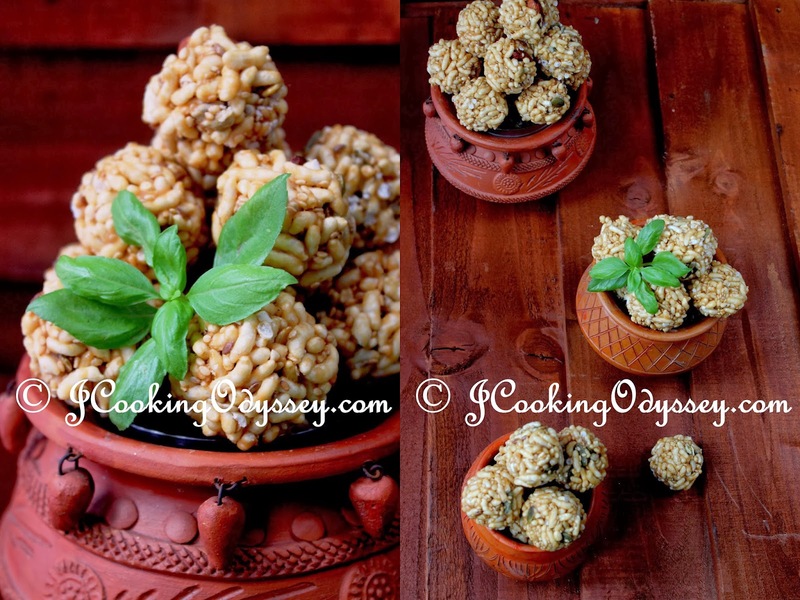 Now add roasted puffed rice and seeds and nuts into jaggery mixture and keep stirring continuously till all the puffed rice coated with jaggery. Turn off the heat, transfer the mixture into another tray. Now work very fast, apply some drops of water or ghee in your palm and take small amount of mixture and make round balls, ( be extra careful, the mixture is piping hot this time ) you have to be very quick and finish making them before mixture gets cold. ( If there are two people make them, can be done faster ). The texture of these ladoo looks so tasty - and love the super-simple ingredient list! These sound like a perfect way to celebrate a special occasion. Classic and delicious ladoo.. looks great! !